Not long after installing a Rekluse Core EXP clutch in our Honda CRF450X, we began noticing that the bike ran just a bit hotter than normal. In a 450X, a bike known for generating copious amounts of heat (even at idle), any increase in temperature is less than great. Our 450 is already equipped with a Jagg Oil Cooler and the left side Fluidyne high capacity radiator - both of which we credit for keeping the bike relatively cool. We considered a fan, but mounting options are less than great with our oil cooler and collection of oversized tanks. 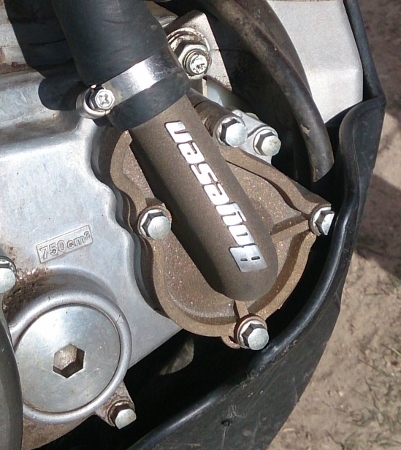 Chris Hymas of Pocatello PowerSports, recommended a Boyesen water pump cover and impeller. A Benjamin and a half later we were out the door and on our way. We addressed our heat issue in three steps, keeping track of temperature change with both an infrared thermometer and our TrailTech Voyager after each step. Step one was to make sure that the Rekluse clutch was adjusted properly, and to change the transmission oil with a fresh batch of our custom Shell Rotella/Honda HP4S mixture. Our clutch was already properly adjusted, so this step yielded no discernible change. Past experience, however, suggests that a Rekluse operating without excessive slip important in this regard. Next we richened-up our low-throttle fuel/air mixture just a bit by raising the needle one position. A previous dyno run had shown that the 450 was sufficiently rich at 1/2 throttle and above, but a bit lean at singletrack throttle positions. This modification proved significant, yielding a consistent 5+ degree Fahrenheit improvement across a broad range of conditions, with no discernible degradation in performance. Finally we installed the Boyesen Supercooler. 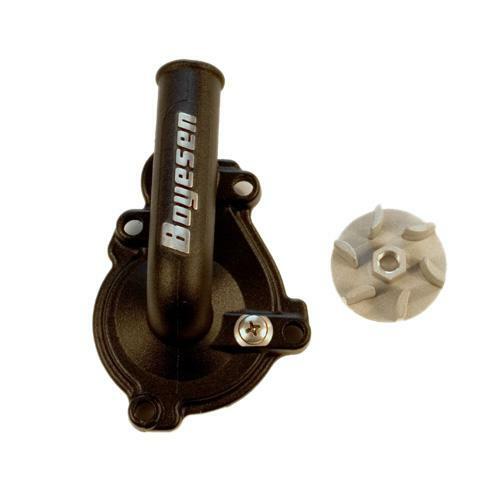 The Boyesen kit consists of a cast aluminum water pump cover and impeller combo. The impeller is claimed to be 25% more efficient at moving coolant than stock, and the entire setup is designed to optimize flow. Installation took roughly 20 minutes with simple tools - including the time it took install a few new hose fittings to accommodate the different-from-stock flange on the Boyesen unit. The Boyesen Supercooler also yielded significant results, lowering the temperature another 5+ degrees very consistently. In the month of so of riding, a mixture of desert sand and mountain trails, we've noticed that our 450X runs noticeably cooler in all conditions. We used one trail in particular, a 14-mile singletrack with two long climbs, to test our bike before and after all modifications. On separate days a month apart, with ambient temps within just a few degrees each day, the post-mod bike ran much cooler everywhere. We rate this procedure a success. Our only nit with the Boyesen kit is that the supplied instructions are pretty incomplete. You'll need to know a bit about how your water pump works before attempting the installation. The Good: The darned thing actually works! The Rad: Three powder coated colors available: silver, black and magnesium. The Gnarly: Instructions could be more complete.